I recently took 3 weeks off from work. They were vacation days that I did not use the previous year so I had to use them or lose them. Being forced to take these three weeks, I didn’t really have anything planned out aside from a quick drive to Portland to visit an old friend. Cat owners will know that they like to sit on everything and this is especially annoying when we play scrabble. One of the would come and sit on the board then mess up the tiles. 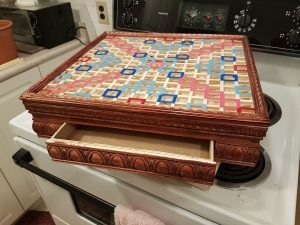 I had looked into buying a Scrabble board with a raised grid and they were hundreds of dollars! After the price shock settled down, I decided to make my own. It would give me something to do and I get to build features into it that the commercial boards do not have such a chute to collect the tiles when you’re done the game. I’ll spare the details on how I made everything because I’m sure many of the methods I used were all wrong. 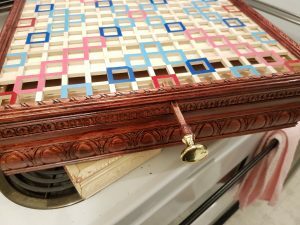 I don’t have proper woodworking tools because it’s not what I do. 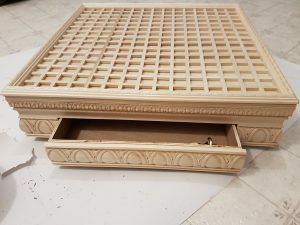 I made the entire thing with a Dremel rotary tool with cutting and routing bits. 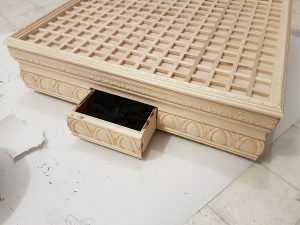 The grid is made of 1/4″ square poplar dowels and the box is made from an 8 piece of crown moulding. Everything purchased at the local Lowe’s home hardware store. 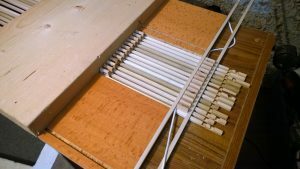 Looking back, I wish I used thinner dowels but I did not know where to buy such a thing until after I built the board. 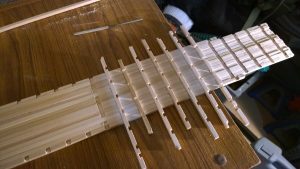 Using 1/8″ dowels, the board would’ve been 2 inches smaller. The initial groove. 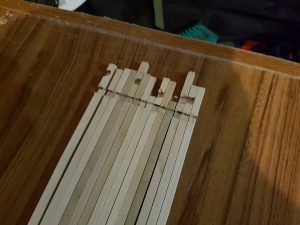 You should be able to fit a spare dowel in there. Using the Scrabble tiles and a piece of rope as a spacer to get the right spacing. I used the rope so that there’s enough of a gap to dig out the tile with your fingernail if you misplace a tile. 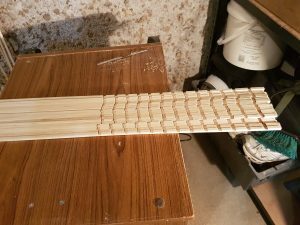 I used spare dowels to hold everything straight as I go along. If I had a proper router, squares, clamps and table saws, I wouldn’t have to improvise. All done the first set. Now do another set to make the complete grid. 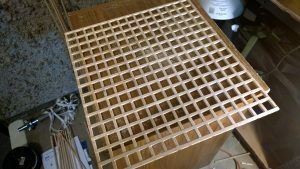 Glueing the grid together with weights. Again, no clamps. 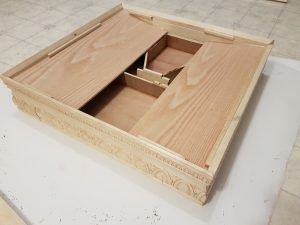 If woodworking was something I did a lot of, I’d invest in proper tools. The grid after trimming off the excess. The box completed. 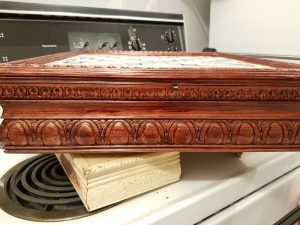 Built with 4″ crown moulding. Just make some bevel cuts and slap it together. You’ll notice a partially completed chute with one piece missing. 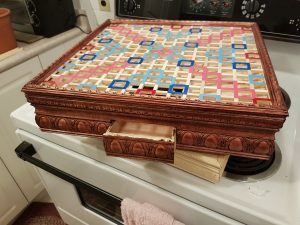 This is to funnel the tile pieces into the drawer. You can pull the drawer out and pour the tiles back in the bag. You’ll also see the guides for the board to slide in and out. 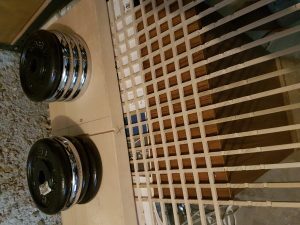 I also made a plunger to push the board out from underneath the grid so that it can be pulled out. 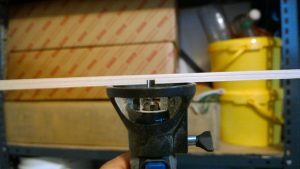 I also glued a lazy susan to the bottom so it can be turned. A lot of things were learned. If I were to do this again, I’d use smaller dowels and proper tools. If space was not an issue, I’d make it taller to give the chute more of an angle so the tiles would slide down easier. I don’t think I’ll be doing this again anytime soon. It’s a lot of work.